On August 7th MEME gallery is hosting The Street Museum - a ONE day transformation of The Wall located in Central Square at 567 Mass Ave.
Local artists, community members, neighborhood youth, and passersby will be invited to be a part of The Street Museum. Participants will create a stencil of their own to add to the collaborative, evolving mural. Everything needed to make a stencil will be provided and available at MEME, located at 55 Norfolk Street. The Wall is a truly inspiring, ever changing space, and is the only legal wall in Cambridge for street artists to create their work. MEME's mission, to be "a space for ephemeral art to be made and witnessed," and the close proximity of The Wall to the gallery make it perfect place to broaden MEME’s reach into public spaces. One day only!! . Come leave your mark. Create a wheat paste or stencil to add to the Wall. 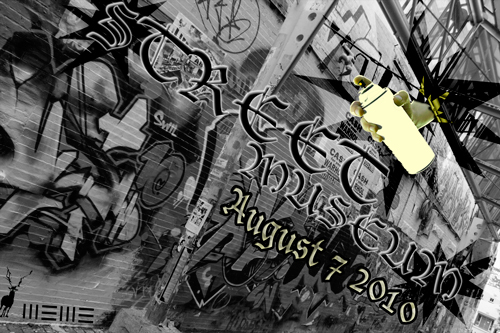 Everything needed to make a stencil will be provided by MEME on August 7th, from 12 noon to 9pm…including spray paint! Or you can make your own and bring it in to put up. We need YOU. \ and YOU AND YOU AND YOU..
Special thanks to: Geoff Hargadon, Fred Carret & Gary Strak of Central Kitchen.